Starting in the '80s and lasting until the year 2001, one of America's largest national anime clubs began in America's smallest state. This club would last the longest, have the widest reach, and the largest membership of any national anime fan group... and you might not have ever heard of it. 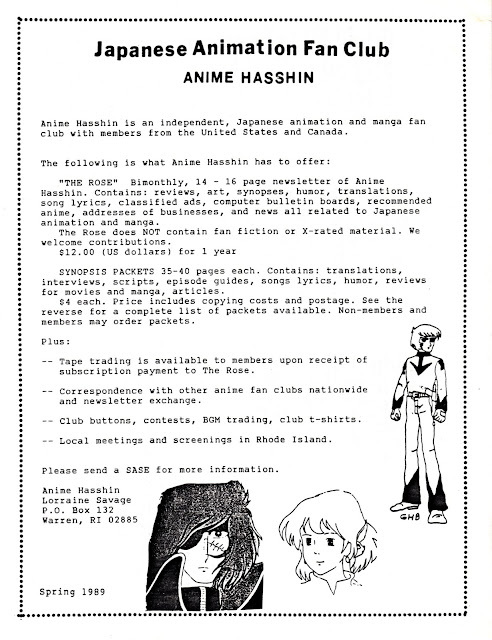 For fifteen years Anime Hasshin published a regular newsletter full of artwork and articles, connected fans with tape-trading volunteers spreading the VHS wealth, and even had a few meetings here and there. Stretching from the VHS days to the Bittorrent era, Anime Hasshin's influence on anime fandom has few equals and was largely the work of one person, founder Lorraine Savage. I caught up with Lorraine recently and she answered a few questions about the club. 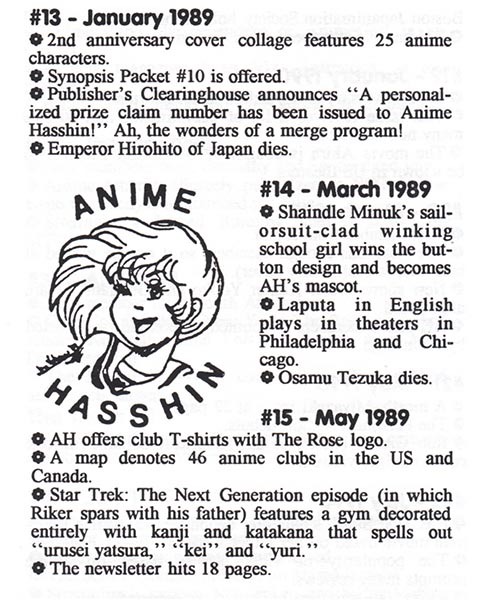 In 1986, North American anime fandom was in transition. Small groups of anime fans met in cities throughout America with only the loosest of connections. The C/FO (Cartoon Fantasy Organization) was changing from its California based leadership and Florida based publications team to administration by Texas fans. 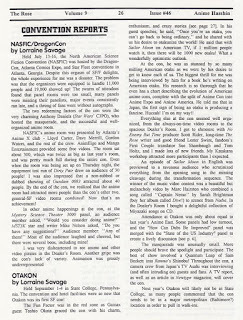 The Star Blazers Fan Club had published its last newsletter in 1984. The Battle Of The Planets Fan Club had not published a newsletter since 1981. 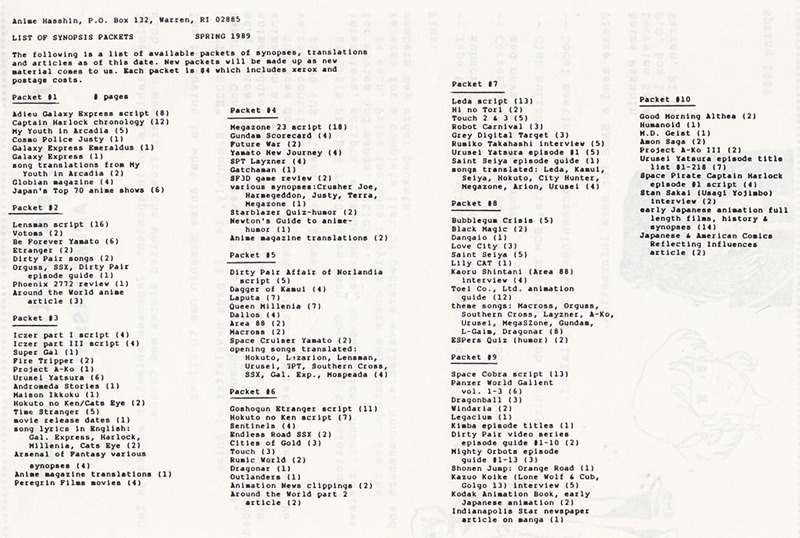 The Earth Defense Command in Dallas was actively publishing their fanzine NOVA, but it was appearing sporadically at the time (only one issue would appear in 1986). The anime fan organizers inspired by Astro Boy, Battle Of The Planets, and Star Blazers were becoming overwhelmed by the popularity of Robotech and the subsequent wave of new interest in Japanese animation this new show inspired. In those days it was very difficult to get information about anime and manga because everything was in Japanese. There was very little in the way of translations and no fan subtitles yet. I couldn’t find what I was looking for so I started a club for people who could share the information they could get. I had a journalism degree so publishing a newsletter was an easy solution for me. 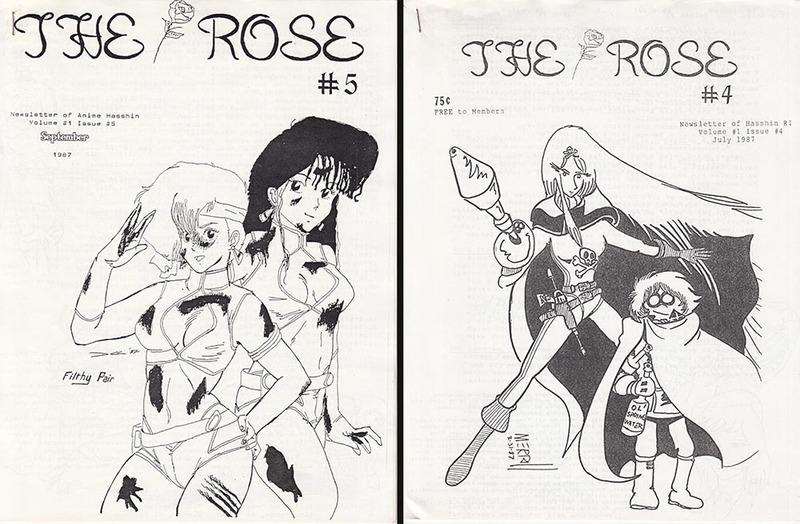 Originally called Hasshin RI (for Rhode Island), the club began in January 1987 with The Rose #1 at 10 pages. Hasshin RI would begin with local meetings and a newsletter. The Rose would start off as a bi-monthly but soon became quarterly. A typical issue would run around 36 pages and include manga reviews, translations of interviews with anime producers, news of upcoming comics releases from Viz, Eternity, Dark Horse, and Antarctic Press, what was coming up in future issues of Animerica, Mangajin, and Anime UK, news of upcoming anime TV series coming to the American market, Anime Hasshin anime poll results (favorite show as of April 1993 – Ranma 1/2), overviews of anime shows like Galaxy Express 999 or Heroic Legend Of Arslan, reviews of translated and Japanese-language manga, translated song lyrics, convention reports from various SF and anime conventions, and classified ads from Kimono My House, Stratus Pagoda, Trans Pacific Laser, Nikaku Animart, Laser Perceptions, and the Brain/Wash Network, as well as a yearly humor supplement called “The Thorn.” Found throughout every issue would be spot fan illustrations from artists like Widya Santoso, Johnathan Luce, Robert DeJesus, Dan Kellaway, Akito Tanemura, Lester Swint, Shaindle Minuk, and many many others. Convention coverage included Otakon, Dragoncon, Atlanta Fantasy Fair, Arisia, and the ill-fated Tezuka Awards handed out at Anime East's last convention. Hasshin RI/Anime Hasshin came into being at a time when the leadership of several extant anime clubs were feuding with each other, and from the start Lorraine was adamant that Anime Hasshin would not be a chapter of any national organization, but it would be its own independent club. Subsequent attempts to involve AH in the fan politicking endemic to the scene failed, and Anime Hasshin outlasted most of these clubs by a fair margin. The first meeting was in 1986 in my apartment with four local friends. We watched Queen Millennia, Endless Road SSX, and Lupin III Mystery of Mamo. When the local club in Rhode Island got bigger we had monthly meetings at a library and at a bank’s meeting room for a few years. It drew attendees from as far away as Boston, and we usually had about 4 to 8 people attend. Peak Anime Hasshin membership was 404 members from 14 countries on 6 continents, including Canada, Mexico, Japan, Malaysia, Brazil, South Africa, Australia, Poland, Germany, and England. An important part of Anime Hasshin was its Tape Traders List; the club maintained a list of volunteers who were willing to copy anime from their collection for other Anime Hasshin members. I believe the first iteration of the list even included people willing to copy Beta tapes and PAL format videos. In the 1980s many anime fans would only copy their tapes in exchange for copies of other shows, which left new fans without many options to acquire new Japanese animation. 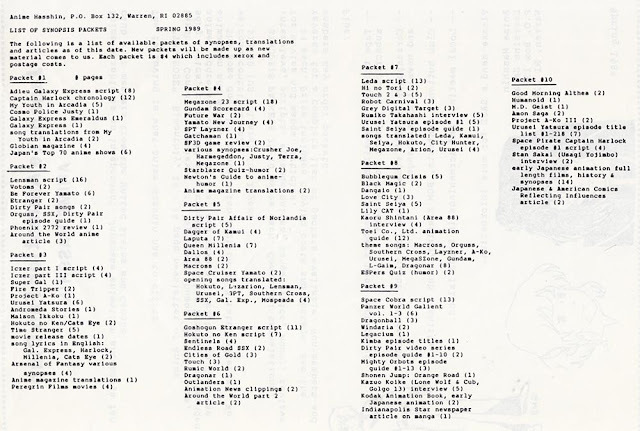 The Anime Hasshin tape traders list featured addresses of dozens of fans who volunteered to copy items from their own collection for anyone who sent a blank tape and return postage. There were dozens of people on the list, all with widely varying collections, so no one trader got overwhelmed with requests (as frequently happened with local clubs) and anime fans in out-of-the-way places, without local clubs or conventions, could experience Japanese animation. Another valuable print-media service AH provided was their synopsis packets. Translations, episode guides, film synopses, and character guides culled from APAs, convention guides, out of print zines, and official sources were available for the cost of photocopying; at least 10 different packets of information were available giving language-impaired nerds a chance to figure out what was going on in Orguss, SPT Layzner, Saint Seiya, Dangaio, Amon Saga, Dagger of Kamui, and dozens of other anime titles. The Rose itself was printed in black and white on standard 8.5 x 11 copy paper, with a colored sheet for the cover, and with two or three staples holding it all together. I used a desktop publishing program to lay out the newsletter and Kinko’s to print and collate it. I labeled and stuffed envelopes myself. I got a bulk mail account at the post office to save money on postage. I was fortunate that I never had to worry about getting enough contributions. For every issue, I had numerous members sending me articles, reviews, artwork, games, classified ads, etc. That’s why there was so much variety in the newsletter. I just let people send whatever they wanted; the only rules were it had to be anime/manga related and no X-rated stuff. People loved to see their work published in The Rose. The Rose’s page count reached a high of 44 pages. In the late 1980s, Japanese animation fandom was venturing online with messaging systems like the newsgroup rec.arts.anime, a text-based platform accessed via university computer networks, volunteer-run BBS systems, or through services like GEnie, Compuserve, or AOL. The first webpage appeared in the early 1990s, inspiring fans to create pages about their favorite shows, and the Anime Web Turnpike went live in 1995, collecting links to these websites. Sailor Moon began airing on US television the same year, and in 1998 the Pokemon TV anime would have its American debut; both shows inspiring new generations of anime fans. By the late 90s anime fans could enjoy DVDs purchased at Best Buy or Suncoast, share anime via peer-to-peer computer networks, and get their anime news from the Anime News Network website. 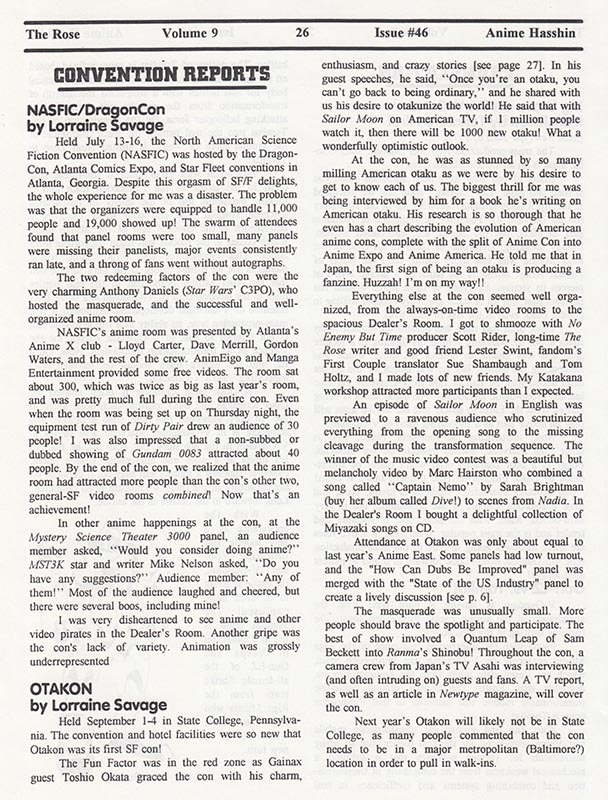 Anime conventions would pop up in every major American city by 1999, giving fans across the country somewhere to go to get their anime fix for at least one weekend. By the end of the decade anime fandom was thriving, above and beyond the 1980s “fan club” model. Throughout this entire period of growth, Anime Hasshin connected anime fans, covering the new anime conventions, detailing new shows, and giving fans an outlet for communication, reviews and artwork. Interesting observation: In the 1980s, anime fans felt lucky when VCRs came into use. We could trade copies, and fans made subtitles. We had it made. Then later, when video stores started selling anime, we were astounded to see a whole section devoted to anime with rows and rows of videos. We felt we had paved the way, and that the professional production companies had discovered that there was a market for anime. The last issue of The Rose was #66 in October 2001 after 14 years of publication. It was a sad farewell as membership declined, but with a promise of Anime Hasshin still existing but moving to a website. However, I had been laid off from my job a year earlier and the club just ended. People were turning to the Internet to get more and faster information. There was surprisingly little controversy over Anime Hasshin and The Rose (if there was, I didn’t hear about it). I always got the newsletter out on time, and people got what they paid for. I was very proud to accept awards on behalf of the club: Outstanding Fan Publication from ChibiCon 1993, Best Anime Fan Club from AnimEast 1994 & 1995, and Best Anime Newsletter from AnimEast 1994 & 1995. I really enjoyed running Anime Hasshin and publishing The Rose. I met so many nice people who enjoyed sharing their love of anime and manga. Thanks again to Lorraine for sharing the story of Anime Hasshin!